Crimereads features a fascinating discussion and exploration of the themes animating the final work of the writer Jean-Patrick Manchette, and why he abandoned the crime novel. Obviously, reports of the crime novel’s death are greatly exaggerated. Their number, variety and loyal followers attest to it. But I was intrigued by the lure he felt for the fusion of noir fiction, spy thriller, and political history. Manchette cites many of my favorites, like John Le Carre and Ross Thomas as having been very influential in his embrace of a new aesthetic. As Ethan Anderson put it in his ‘Do The M@th‘ blog about Ross Thomas’s work: “Thomas’s outsized passion for the mid-century American system gave his books a unique ambience, at once humorously bitter and happily jaded.” For his part, LeCarre gave us the anti-James Bond, George Smiley, a quiet, pudgy, near-sighted cuckold. When I come to write the stories that grab me, I’m drawn to this noir-spy hybrid. It’s a rich vein of crime and realpolitic, combining detective work and contemporary politics—a “who dunnit” (and why), plus “who gets power and why.” Leavening this compelling mixture is the fact that the things government (and quasi-government) operatives do to achieve their ends are often downright criminal, adding a noir level of complexity and moral uncertainty. Putting characters into a story where not only crime but competing values are involved makes for rich, vivid storytelling. The tales of Le Carre and Thomas, though exemplars of the suspense-thriller genre, are generally less concerned with the literally ticking time bomb, and more about what’s going wrong and how to right it. To Manchette’s list of influential writers in this hybrid genre, I would add Graham Greene. His “entertainments,” like The Quiet American, The Third Man, Our Man in Havana and The Honorary Consul are extraordinary. Political events are not just backdrops for Greene’s and the others’ stories, they are integral, giving deeper meaning to the characters’ struggles and to the stakes if they fail. They inform the stories and give them an edge, whether it be Viet Nam as the Americans replace the French (Quiet American), or the gullible Agency in Our Man in Havana. As I struggle to write engaging thrillers, I keep these and other works in my mind, not to copy, but as strong examples of all that’s possible. To write now, in the context of the decline of democracy, the rise of nationalism, backlash against globalism, fraying political alliances and norms, is to stare at a reality that’s all too noir. Situational morality, suspect propaganda and win-at-any-cost gambits used to be the province of clandestine agencies. Now it’s mainstream politics. If, with apologies to Carl von Clausewitz, “politics is war by other means,” then we are simultaneously the prize to be won and the foe. “How the hell did it all come to this?” is a question we should all be asking. 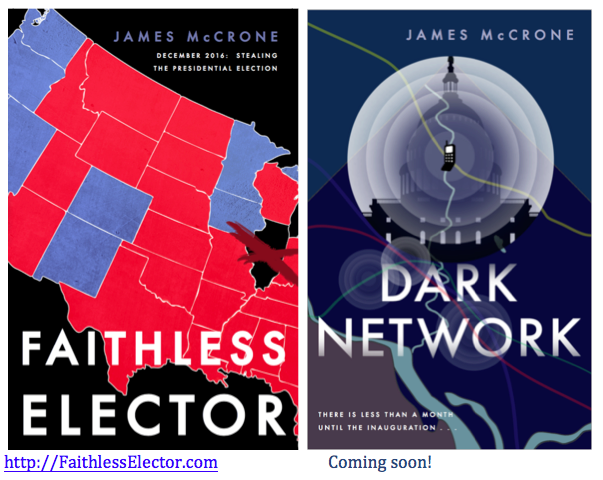 James McCrone is the author of the Imogen Trager political suspense-thriller series Faithless Elector and Dark Network. The final book in the series is due out at the end of this year. In the past, I’ve joked that there’s a well-worn path between downtown revitalization non-profits and writing thrillers…because let’s face it, there isn’t. Lately, as I think about it, I’m not so sure it’s a joke. My former jobs were perfect training for writing thrillers. Recently, I was a late addition to a panel at “A Mysterious Affair in Princeton” put on by the Cloak & Dagger bookstore, which was a fantastic “affair,” with great speakers and a very nice turnout of mystery-thriller readers who had insightful questions. The day’s final speaker was SJ Rozan, best known for the Lydia Chin/Bill Smith series and other mysteries. Her talk revolved around why people are drawn to mysteries and thrillers. She began by discussing “ur” stories, or essential narratives, that we tell ourselves over and again. The job of mysteries, she said, going back to their essence as “ur” stories, “is to provide an explanation” for what happened in an otherwise arbitrary, indifferent world. The essence of a thriller, she noted, my ears pricking up farther, is simply: “is there enough time?” Can the hero(es) stop the ticking bomb or thwart the bad guys? What will it take to stop it? As good as her talk was, I’m afraid I started thinking a lot about thrillers and stopped listening. My thrillers are indeed predicated on timing. In Faithless Elector, the tension concerns whether the heroine and hero can get the information out in time to stop the conspiracy, and in Dark Network, they’re confronted with a plot no one initially believes exists. In both cases, if the presidency is stolen—as we’re seeing now in the real world—it’s next to impossible to effect meaningful change after the fact. This past week, I applied for a part-time job with a commercial district management organization. As I worked on my cover letter, wondering how much (or even if!) I should discuss writing novels as the reason for my hiatus from the world of non-profits, I found myself thinking about what leadership of a non-profit entailed. It turns out, managing a commercial district is perfect training for thrillers. Not that death and mayhem are ever part of the work, thankfully, but the planning and execution is eerily similar to plotting a thriller. First, (Act One, let’s call it) there is a cast of characters in any district. In order to be effective, the district manager must know who the main players are, who the ancillary players are, how they interact and what it is they want. Scene setting, exposition. Often what they want is at odds with what others want, and they will coalesce into mini interest groups—Conflict! And then something happens to disrupt the equilibrium (such as it is). Information that wasn’t meant to come to light is revealed, or someone is murdered…or there is a block grant available. Which takes us to Act Two. Act Two, then, is where the main character encounters obstacle after obstacle toward achieving his/her goal of exposing the conspiracy or beginning a façade improvement program. Anyone who has worked in non-profit/local government will recognize this trope, and any such person might be forgiven for having daydreamed a timely murder or two. Act Two sees the “first culmination” wherein it looks like the hero(ine)/district manager will achieve their goal. Inevitably, everything falls apart, leading to the “midpoint,” where it seems all hope is lost. This leads naturally to Act Three, and the “climax” –the point of maximum tension where the opposing forces confront one another (Board meeting, anyone?). Act Three, then, shows how the world/commercial district returns to equilibrium having successfully navigated the obstacles—or failed miserably. It’s the ending, however, where the non-profit and the fictional worlds diverge. The thriller writer Tom Clancy once famously said: “The difference between reality and fiction is that fiction has to make sense.” He might just as easily have been talking about the difference between non-profit district management and thrillers. Apparently, Imogen Trager, the heroine of my books, Faithless Elector and Dark Network has a larger online presence than I do! When a friend recently took a Facebook personality test, it concluded that my friend should consider becoming an FBI agent. Jokingly, I suggested she change her name to Imogen Trager–who is an FBI Agent. My friend felt she knew the name (she has read the book), but Googled it nevertheless. To her (and my!) surprise, Imogen has quite a large online presence. In fact, Imogen Trager has a larger, more consistent online presence than I have. I find I’m a bit jealous. Or is it darker than that? All writers hope their characters have a life “beyond the page.” We hope they seem real. I remember one of the highest compliments I received some 25 years ago was from an acquaintance who told me how at a dinner party he’d started telling a story about something that had happened to a friend of his. But as he told the story, he later related to me, he realized he was talking about a scene from the book I was writing back then, and the “friend” he was talking about was a character in the book he had read. Why did that earlier instance make me feel good, where this leaves me troubled? Am I a modern-day Major Kovalyov, obsessed with status and rank? In Nikolai Gogol’s absurdist short story, “The Nose,” Major Kovalyov’s nose goes missing and ends up living a better life than he, its owner. Kovalyov frets and seethes because his nose achieves greater social rank (status) than he ever had himself. Perhaps the difference between now and 25 years ago is the nature of status: how it’s achieved, and what it represents. In the indy-publishing business, we live by ‘mentions,’ ‘likes,’ and ‘follows;’ by ‘shares,’ author- and sales rankings–all of it contributing to our rank (our “status?”) in search engines. To be on page two of the search results is almost as bad as not existing. I think it must be the exclusivity of her presence on the search results page that bothers me. Her rank is such that the first two pages of search results relate to her and no one else; whereas I have to share my “james mccrone” presence with a musician, an insurance broker in London (they seem like very nice people) and an ad for Ancestry.com. Will Imogen and her red hair continue this life of their own? Will her status grow and mine wane? James McCrone is the author of the political suspense-thriller series Faithless Elector and Dark Network….featuring Imogen Trager. A well-crafted political thriller should feel “real.” To do so, it has to flirt with real events. But sometimes I worry I’m sailing just a bit too close to the wind.